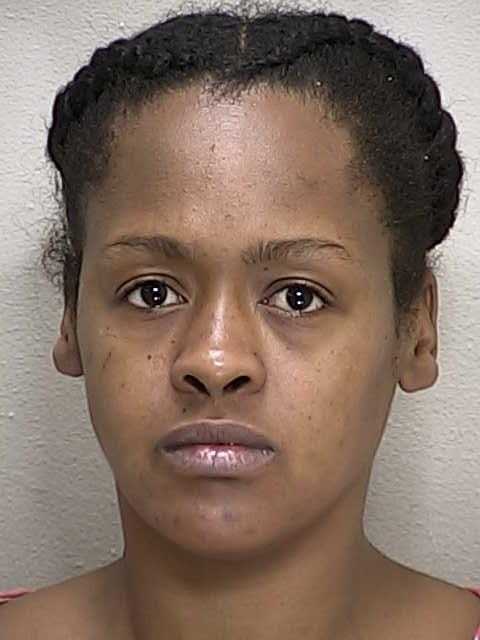 Ocala, Florida — A 33-year-old woman was arrested after she pushed someone down a flight of stairs and kicked police officers. The Ocala Police Department was dispatched to the 900 block of 6th Terrace, in reference to someone that had possibly fallen and needed help. Upon arrival, police learned that the victim had actually been pushed by Jesheare N. Davis. According to reports, when police made contact with Davis she was both verbally and physically aggressive toward them. Police stated that as they attempted to separate Davis from the victim, Davis pushed one of the police officers. Davis then attempted to go around police and advance toward the victim. Due to Davis being so aggressive, she had to be handcuffed and placed in the back of a patrol car. After she spat at police, Davis stated that if they came near her she would kick them. A short time later, Davis kicked one of the officers three times. Police attempted to secure Davis in a hobble restraint to prevent her from harming herself or someone else, but she was too aggressive. According to reports, while Davis was in the back of the patrol car she attempted to kick out the windows. The decision was then made to transport her to the Marion County Jail. Once at the jail, it took several officers to remove her from the patrol car. During the struggle, she kicked an officer in the stomach. Davis was finally subdued and booked into the jail. She was charged with Battery, Battery on a Law Enforcement Officer (x2), Resisting Arrest with Violence, and Simple Battery (x2). Davis is being held on a $43,000 bond.